Well, this morning I woke up a little groggy and slow, so after getting dressed, eating some Rice Krispies, and saying goodbye to the children, I settled into my "bed workspace" with my laptop to tackle all the email that has built-up over the weekend. I clicked on "email game" because I've found that's a great way to buzz through the email quickly, feeling challenged to deal with every single email without skipping any. I was just getting on a roll and feeling really good about my accomplishments, when my husband Lonny came in and said, "Don't you have a dentist appointment at 9am?" ARG! I had completely forgotten. Last night as I was looking over my calendar I realized that I had the appointment, but this morning it was erased from my mind! Another reason to make sure and LOOK at the calendar FIRST THING every morning, right? So, I jumped up quickly since it was already 8:30am and it takes about 20 minutes to get over to the dentist's office. I really needed a bath because my hair was disshelveled and greasy, but there wasn't any time for that. I put it into a hopeless ponytail, low on my head since I would be laying back in a dentist chair. Then I grabbed my baggy jeans and a comfy long-sleeve shirt so I could look half-way decent but still be comfy during my dental work. Last week I went to the dentist and learned that I was going to need a tooth totally redone - I think he said a cap. A portion of it had broken off a couple of months ago, and while it had alarmed me at first, it didn't hurt at all, so I thought it might have been a piece of dental work, not the actual tooth. Considering our efforts to save money right now, I just kept putting off going in. SO - now that I knew the truth (it was real tooth broken off, with dentin showing - the dentist couldn't believe I hadn't felt any pain!) and the tooth was cracked, I had some major dental work. So he had postponed my cleaning and said I could so it when I had my regular dental work done, which I was very happy about because the cleanings are so uncomfortable, it would be nice to have the gas for that. 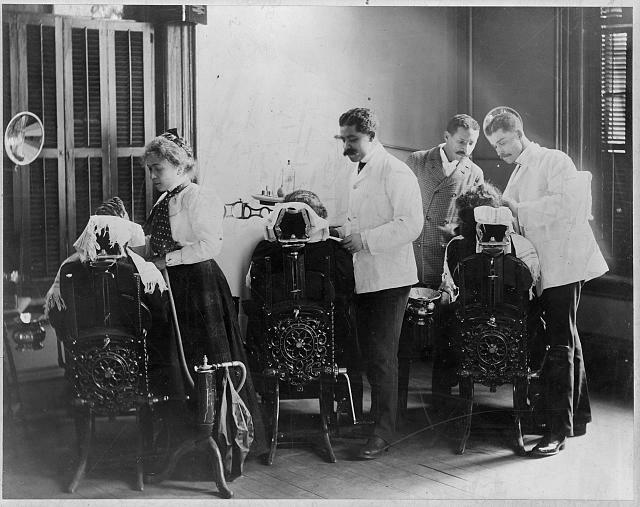 "Dentistry at Howard University, Washington, D.C., ca. 1900"
Anyway - so we were rushing around and I was wishing I hadn't taken my meds yet because I wasn't sure how they would react with dental gas, and thinking to myself, OH WELL! I also had the thought occur to me that it was odd that they hadn't called to let me know that my appointment was today. They nearly always make a reminder call on the morning of your appointment, or the night before if it's a really early one. But I brushed it off, after all, there wasn't time to call. Lonny was driving me because I am always really groggy for far too long after they stop administering the nitrous oxide, and I don't think it's safe for me to be driving myself home. We drove over there quickly, arriving about 10 minutes late. There were tree branches broken and laying all over the sidewalk in front of the building. I guess all that snow that dumped on us yesterday was particularly hard on Dr. Rees's trees. We stepped over the branches and the extension cords to the power tools that a worker was using the clean up the mess, and entered the office, panting and stomping our feet. The clerk looked up at me, as did the hygienist, and they both had quizzical looks on their faces. Usually they say, "Hi Erika! How are you? Dr. Rees will be ready in a minute." I had a fleeting thought that I was in a dream, but shook it off and walked up to the desk. "Hi - I have an appointment at 9am. Erika Ward." She looked at her computer and typed a few things, then weakly said, "okay. . . well, I don't have you on the schedule for this morning. Let's see. . . it looks like I have you at tomorrow morning at 9am." The only thing I can say is that I'm glad I hadn't had to get a bunch of toddlers ready to go with me and then dragged them all over there. I wish I had listened to that still small voice that kept putting little thoughts in my mind about calling to check on the appointment. Oh well. Lonny sweetly said, "Well, at least I got to spend half an hour holding your hand while we drove." Is he the best or what?